Keegan Cook Finberg [she/her/hers], Assistant Professor of English, specializes in poetry and modern and contemporary literature of the United States, particularly experimental and avant-garde works. She researches across several disciplines including poetry and poetics, critical theory, feminist studies, modern and contemporary art, media, and performance. She is currently at work on a book project which traces the expansion of the category of poetry in relation to the privatization of the U.S. welfare state in the second half of the twentieth century. An earlier version of this work was awarded a University of California Chancellor’s Dissertation-Year Fellowship. 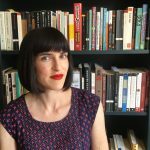 Her academic essays about poetry, urban space, and queer practice have been published in Textual Practice and Canada and Beyond, and her public scholarship has appeared in Jacket2, The Rumpus, The Believer, and elsewhere. She is also a publishing poet. Her debut poetry chapbook, The Thought of Preservation (Ursus Americanus Press 2019), considers the language of polite racism and misogyny in online social forums for neighborhoods undergoing gentrification. Dr. Finberg has taught literature and gender studies, as well as creative and academic writing at the University of California, Santa Cruz, Vanderbilt University, and the University of Southern Indiana. For more information on her work, please visit https://keegancfinberg.net/.